Parrasch Heijnen Gallery is pleased to announce Charles Ross: Solar Burns, Prisms, and Explosion Drawings, the renowned land artist’s first solo gallery exhibition in Los Angeles. This show is scheduled to coincide with the exhibition Los Angeles to New York: Dwan Gallery, 1959 - 1971 at the Los Angeles County Museum of Art, in which a number of Ross’ iconic early works are included. In the late 1960s, Sol LeWitt encouraged Charles Ross to approach Virginia Dwan, the vanguard dealer of minimal art and earthworks. After engaging her in a conversation about prisms and crystals, Dwan was eager to visit Ross’ studio. 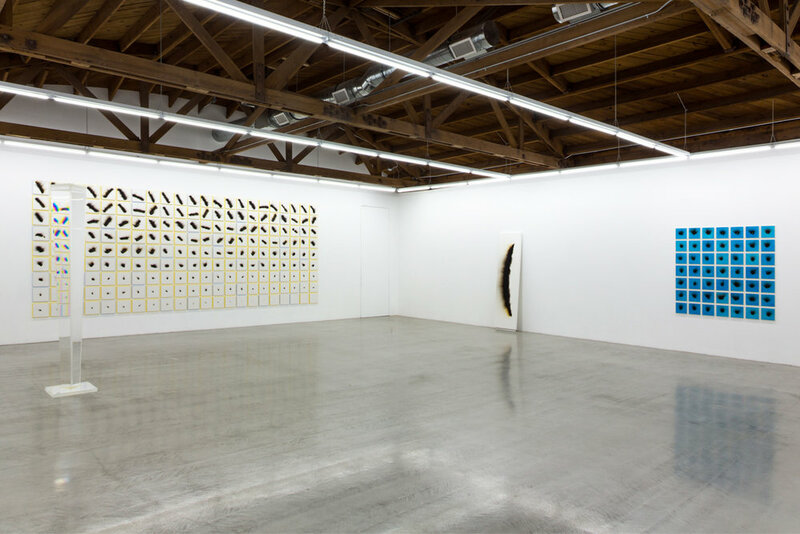 The following year he had his first of three shows in Dwan’s eponymous New York gallery, joining the ranks of the artists Dwan championed and exhibited in New York and Los Angeles until the closure of the gallery in 1971. Charles Ross: Solar Burns, Prisms, and Explosion Drawings focuses on works from three distinct series spanning a select overview of the artist’s fifty-five year career. Ross’ “Prism Series,” which he began in the mid-1960s and first showed at Virginia Dwan Gallery in New York in 1969, is represented by two works in this show. These breakthrough prism structures were a foray into Ross’ investigations of light as a medium. The “Prism” sculptures require an interaction with light, functioning to alter their immediate surroundings. 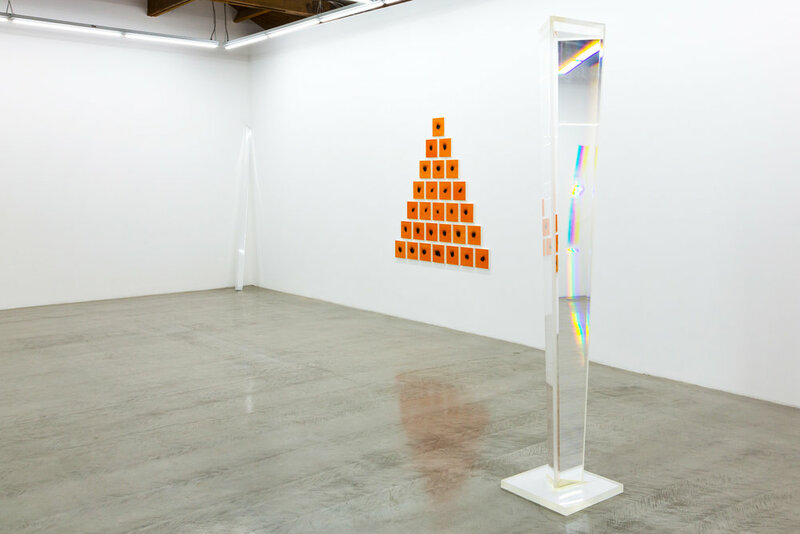 Central to the show, Tapered Column 2004, an iconic eight-foot freestanding prism sculpture filled with optically formulated liquid, presides in the main space over a range of works from the artist’s “Solar Burn” series dating from 2005-2016. Ross began creating his “Solar Burn” work in 1971 using a time-based and interactive series of magnified sunlight exposures on treated wood panels. In diametric opposition to the dispersal of light he created with his prisms, the “Solar Burns” demonstrate the sun’s direct path to form, what Ross describes as “portraits of light.” These works document either the rotation of the earth for a full day or week, or the time it takes sunlight to reach the earth in single units arranged by mathematical combinations relating to the cosmos. The front gallery features three major works from the “Explosion Drawings” series, which Ross initially conceived in the early 1980s. Responding to quantum and cosmological levels of light, Ross created these drawing using dynamite and pigment, diagramming the physicality of light and its interaction with matter. Charles Ross (b. 1937, Philadelphia, PA) was an undergraduate student pursuing his degree in mathematics at the University of California, Berkeley when he took a beginning sculpture class in order to fulfill a liberal arts requirement. This course engaged Ross and he quickly transitioned from mathematical proofs and the physics lab to the art studio. Following graduation in 1960, Ross enrolled in the MA program at Berkeley, which he completed in 1962. Ever since, Ross has dedicated his life and career to making art that responds conceptually to the effects of light, time, mathematical structures, and the formal and visual potential of phenomena. Though he has steadfastly maintained a process and practice that is largely and intentionally disconnected from the framework of continuous commercial gallery presence, Ross is significantly influential amongst a core following of fellow artists, collectors, curators, mathematicians, and scientists. In 1971, Ross conceived of the work for which he is, to this day, perhaps most significantly known: Star Axis, the monumental eleven-story architectural earthwork, a naked eye observatory designed in coordination with the Earth’s axis and the star Polaris, in order to bring star geometry down to earth. Actual construction began atop a mesa in central New Mexico in 1976, and this work, over 40 years in the making and the focus of much of Ross’ life and career, is slated for completion and access to the public within the next few years. The interchange between light and matter has remained at the core of the artist’s formal interests as Ross continues to engage the language of mathematical and spectral phenomena in an interactive practice that both responds to and reflects his aesthetic consciousness. Charles Ross is a 2011 Guggenheim Fellow and recipient of a 1999 Andy Warhol Foundation Grant. His works reside in the permanent collections of numerous institutions internationally including the Centre Georges Pompidou (Paris), the Walker Art Center (Minneapolis), and the Whitney Museum of American Art (New York). He is included in James Crump’s 2015 film Troublemakers: The Story of Land Art alongside other earthwork artists such as Vito Acconci, Walter De Maria, Michael Heizer, Nancy Holt, and Robert Smithson. Most recently Ross’ work has shown at the Museum of Contemporary Art, Los Angeles; Reina Sofia Museum, Madrid; Ludwig Museum Koblenz, Germany; Palazzo Fortuny, Venice, and is currently featured in Los Angeles to New York: The Dwan Gallery, 1959 - 1971 on view at the Los Angeles County Museum of Art. Parrasch Heijnen Gallery thanks L. Malle Arts, Paris for cooperation in presenting Charles Ross: Solar Burns, Prisms, and Explosion Drawings, which will be on view in the gallery from March 16 – April 28, 2017.